Once nothing more than a sleepy retirement community for east coasters, the Tampa Bay area is now a bustling, modern metropolis that offers a wide range of entertainment opportunities for both vacationers and locals. It is an important cruise departure/arrival port for tourists heading to the Western Caribbean and Panama Canal, and those who choose to spend a couple of days in the region before or after their cruise will delight in the wonderful mix of Old and New World charm, the beautiful beaches and the myriad of fine shops and restaurants. Cruises depart from the Port of Tampa Cruise Terminal, a modern facility located just a few minutes from the central business district. The terminal is adjacent to the Channelside Complex which is full of gift shops, movie cinemas and restaurants. There are several bank branches and a number of ATMs at the terminal, and visitors can take a waterfront cruise via catamaran for free. Taxis and public buses can be hailed at the terminal facility, which includes a full-service parking garage. One of the biggest tourist draws in the region is the Busch Gardens, located off of Busch Blvd. 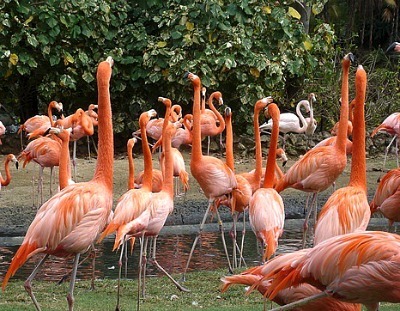 Perfect for families, this amusement park has every conceivable kind of ride, offers an off-road safari and the complex holds the largest zoo in all of Florida. Right beside the cruise terminal one finds the Florida Aquarium, home to more than 5,000 animal and plant species. 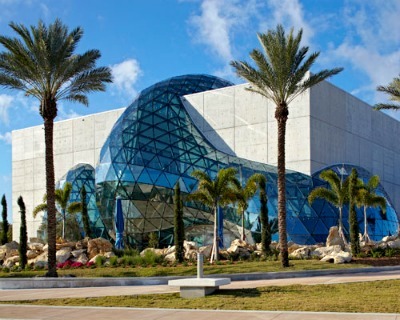 At 1 Dali Blvd is another of Tampa Bay's marvels - the extraordinary Salvador Dali Museum. The largest collections of works by the famous artist can be seen here daily. And just a short taxi ride away is St. Petersburg, with its beautiful 19th century architecture and the famous Central Avenue that is chock full of antique shops. Beach enthusiasts should head north to Clearwater, where the North American equivalent to Rio's Ipanema is found. Some of the best surfing, plenty of volleyball and the finest white sand in Florida awaits here. And don't forget the Tampa Bay Rays of the American League, who play their home games at Tropicana Field. Over 2,000 restaurants are found in the Tampa Bay area, many of them specializing in Cajun, West Indian and Southern U.S. cuisine. Near the cruise terminal at 615 Channelside Drive is the popular Tinatapa's Restaurant, serving up a variety of shrimp dishes, gazpacho and soups, bread and salads. The Columbia Restaurant in the historic Ybor City district is one of the oldest eateries in the state, and besides the great food, visitors will love the live performances by flamenco dancers. In St. Petersburg the place to be is Skyway Jack's, popular with the locals and featuring breakfast anytime. The French toast, crepes and the renowned creamed chipped beef are the best in town. Aside from the taxis, which can be called for at the cruise terminal and from any major hotel, the airport shuttles will take passengers from the Tampa International Airport to downtown, the waterfront and also to St. Petersburg. Rental cars can be reserved and can be picked up or dropped off both at the airport and the cruise terminal. Public buses and trolleys are operated by HART, and its TECO line streetcar operates between all the major waterfront destinations and the central business district. The weather in Tampa can change in an instant, and the high humidity means a lot of freshening up in the restrooms. Bring light raingear when visiting this part of Western Florida, and be ready for slick roads and possible splash from vehicle tires. Near the cruise terminal and at most major hotels there are Internet cafes for those wanting to use their laptops. But above all, be ready for extremely friendly natives, excellent public transportation and plenty of fun and adventure before or after the cruise. 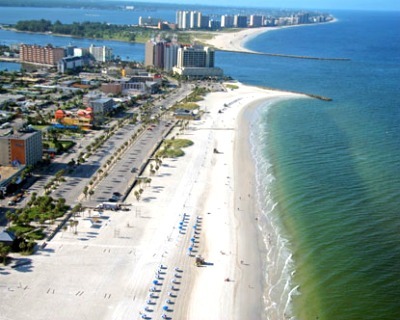 The Clearwater beach, a popular destination for both locals and tourists. Busch Gardens has a great safari as well as a great number of crazy rollercoaster rides. Even the building that hosts the Salvador Dali Museum is highly artistic. 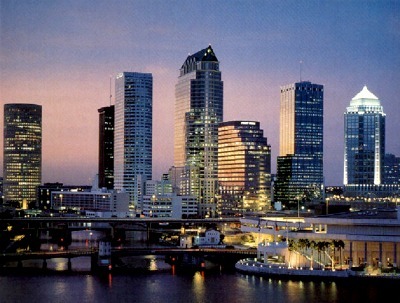 The Tampa skyline at night.